I use the double sided tape! If you will be using the tailstock for support, almost anything will work… but if you want to turn something without the tailstock (like on the bowl blanks above), then you want as strong a bond as possible. YMMV. The best super glue I’ve ever tried is Loctite Pro in the blue bottle. And I’ve tried a lot of super glues. I used to use carpenters glue paper joints and had to wait a day before turning depending upon time of the year. Also used hot melt glue for turning small items with a tenon glued into a hole in waste block. I still use both methods if helps design of what am turning. If wanted fast just used face plates and screws back then and will if feel necessary today. CA glue is fast but doesn’t have much shear strength, having said that turners been using it for years. Brand to doesn’t matter as much as when it was made. Shelf life not more than 1 or 2 years. Older it gets reliability becomes iffy. Today everyone seems to be hung up on a chuck for their lathe which is understandable given the price of extra face plates and time to mount wood on the lathe. Sometimes the old methods just as good and as safe. I use Scotch brand High Performance Repair Glue for my projects. It’s very strong and dries very quick. For wood to wood contact regular PVA white or yellow wood glues probably the best choice for the money. Never used a wood tap & die set, my thread chaser set hangs on the wall unused! Think if devote a day to scrounging wood (fire or pallet wood) to make your tap & die face plates glue drying times will not be a problem. With exception of hot melt & two sided tape which can use in seconds or minutes all other glues require 24 hours to reach full strength. Not sure would use two sided tape but hot melt glue might work in a pinch but would not use it for every faceplate you make. Started out using faceplates with wood waste blocks turning bowls. Either screwed the blank onto the faceplate using sheet metal screws after learning sheet rock screws not the best or waste blocks and glued paper joints. Got most of my wood for waste blocks mostly poplar or oak pallets from trash bin behind a furniture store. 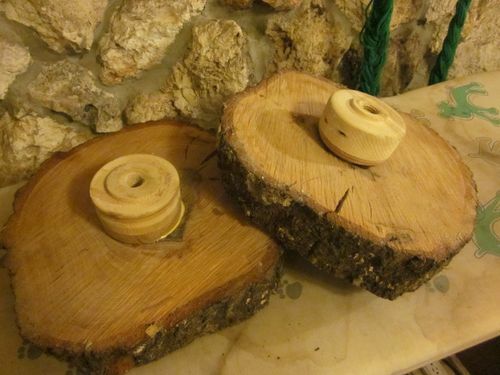 Started turning between centers before mounting on my faceplates & waste blocks. I know a lot of people use CA, hot-melt, double-faced tape, etc. and seem to be satisfied with their choice. Personally I don’t trust any of them. I use PVA (Titebond I) on hardwood glue blocks and let them dry overnight. Never been a problem. What’s the hurry? no real hurry I will use the PVA most of the time, but it happened a couple time when i couldn’t do a project because I had a piece between centers drying. Need to figure out a clamp system so I don’t have to do it in the lathe. By far hands down, the strongest “super glue” is Gorilla Glue. I don’t know what they do differently, but it’s my instant go-to CA when I don’t need thin CA. Loc-Tite is on the bottom of the list. If you just can’t wait, then use 5 minute epoxy. Clamp a waste block to your piece and wait about 15 minutes and you are good to go. No need to clamp between centers use any kind of clamp to hold the block to the blank, then screw your block onto the lathe. I use scraps of 2X to make waste blocks and tape my blank to it with turners tape. It is not the foam double sided tape, it’s made for turning and as long as the surfaces are flat, it will hold. Have to pry pieces apart with a chisel. Even rough pieces like Mr. Unix showed need to have the bottom flattend to install on the lathe or screw it to a face plate, even glue wont hold if the mating faces are not flat together. And yes, I do use turners tape to hold cookies for turning.